We are members of, or partner with, a number of organizations that provide collaborative opportunities for enhancing and increasing our public engagement. American Council of Learned Societies (ACLS): A private, nonprofit federation of 72 national scholarly organizations, ACLS is the preeminent representative of American scholarship in the humanities and related social sciences. Advancing scholarship by awarding fellowships and strengthening relations among learned societies is central to ACLS’s work. Other activities include support for scholarly conferences, reference works, and scholarly communication innovations. NCA was admitted to ACLS in 1997. American Association for the Advancement of Science (AAAS): The AAAS seeks to "advance science, engineering, and innovation throughout the world for the benefit of all people." The world's largest multidisciplinary scientific society and a leading publisher of cutting-edge research through its Science family of journals, AAAS has individual members in more than 91 countries around the globe. Coalition on the Academic Workforce (CAW): A group of higher education associations, disciplinary associations, and faculty organizations committed to addressing issues associated with deteriorating faculty working conditions and their effect on college and university students in the United States. NCA was elected to CAW in 2014. Coalition for National Science Funding (CNSF): The Coalition for National Science Funding is an alliance of more than 100 organizations united by a concern for the future vitality of the national science, mathematics, and engineering enterprise. CNSF supports the goal of increasing the national investment in the National Science Foundation's research and education programs in response to the unprecedented scientific, technological, and economic opportunities facing the United States. Coalition to Promote Research (CPR): CPR is a coalition of organizations interested in promoting public health through research. CPR organizations represent scientists, physicians, health care providers, patients, and advocates that support federal investments in basic biomedical and behavioral research. 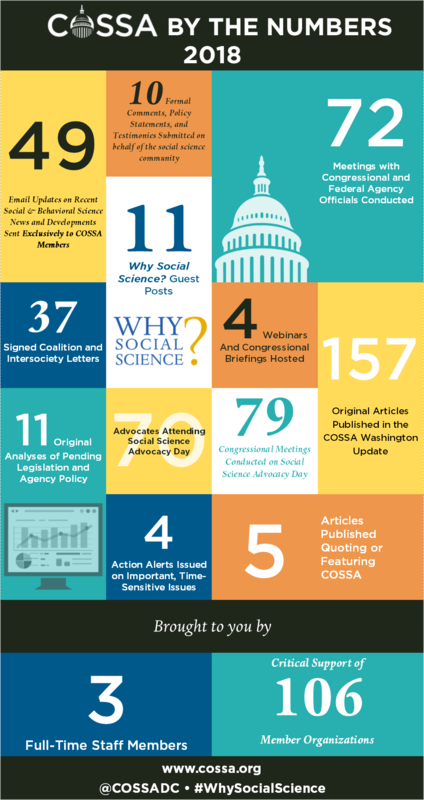 Consortium of Social Science Associations (COSSA): Founded in 1981, COSSA is a Washington, DC-based advocacy effort that monitors all federal agencies that provide support for social and behavioral research, and advocates for a non-politicized research agenda. NCA is one of 18 governing members of COSSA. National Humanities Alliance (NHA): NHA is an advocacy coalition dedicated to the advancement of humanities education, research, preservation, and public programs. NHA is supported by more than 100 national, state, and local member organizations and institutions, including: scholarly and professional associations; higher education associations; organizations of museums, libraries, historical societies, and state humanities councils; university-based and independent humanities research centers; and colleges and universities. Science Debate asks candidates, elected officials, the public and the media to focus more on science policy issues of vital importance to modern life. As a registered 501(c)(3), Science Debate is nonpartisan. Science Debate encourages everyone to ask their candidates to discuss and debate their science and technology policies for the well-being of our nation and society.